The Google Chromecast allows you to stream media content from your laptop, tablet and smartphone to your TV. Simply plug it in via the HDMI port and that's it. The device has been available for a number of years and now comes in multiple versions. You can also mirror the display of your laptop to the TV, using it as a second monitor - which is great for presentations, showing photos or watching films. We the prices of the Google Chromecast and let you know of the best deals below. 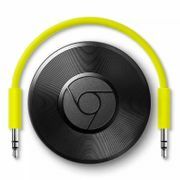 Google Chromecast Audio - Save £8! Buy a GOOGLE Home Mini and Get a FREE Chromecast! If you don’t have a smart TV to view iPlayer or Netfliix, Chromecast will solve that problem. The device is priced cleverly at £30 and you can turn your regular TV into a Smart TV in no time. With the Google Chromecast device and app for Android and iOS, you can easily incorporate your smart devices into your TV with a few simple taps of a button. Since it was first launched, Google has released a Chromecast Ultra version which offers HDR and 4K capabilities, but its more expensive than the original version and might suit you more if you don’t have a 4K TV. So if you have an HD TV, it is recommended to get the original Chromecast. In addition, even if you’re TV, it’s probably better to use its built-in apps, but if you lack those then you may considers buying the £69 Ultra version for streaming media. The media streamer is very easy to set up and it’s compatible with a wide range of services. With its price, it’s a great buy for anyone. If you’re looking to find cheap Google Chromecast in the UK to further save money, here at Latest Deals you will find the latest Chromecast sale, deals, offers and vouchers from retailers like eBay, Tesco, Argos and more! 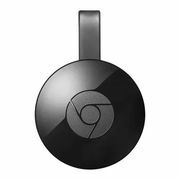 Get the best Chromecast cheapest price like Chromecast offers £15 and Chromecast sale £18 as well as Chromecast 2 offers. Easy to set up and to operate. Impressive cross-platform search for its price range. Streams YouTube, Netflx, Spotify, HBO, Pandora and thousands of different apps and games to your smart TV using an iOS or Android phone or tablet even a PC as its controller. No support for 4K streaming. Searching is a bit difficult. No remote so you will need your smartphone, tablet or PC always nearby to use it. Its 4K streaming feature works really great for both Ethernet and WiFi. Compatible with most popular streaming services. Does not totally support all apps. It does not support Amazon Instant Video. Video quality is marginal and needs improvement over 1080p streaming devices. 4K content selection at launch is limited. It’s twice as expensive at the regular version. Where can I find cheap Chromecast offers in the UK? You can get Chromecast sale for £18 at eBay, thus by far the Chromecast cheapest price in the UK. Cheap Chromecast Tesco and Currys deal is at £19. Currys has slashed 50% off the price of Google Chromecast Audio, bringing it down to only £15. Chromecast 2 offers at My Memory is the cheapest at £27.99, while you can get if for £28.99 at Very and Tesco. Chromecast Ultra is currently priced at £69 on almost all major UK retailers, savings will just depend on the retailer’s offers. For example, John Lewis offers free delivery and a 2 year guarantee for the device, while you can get special offers on Tesco for it like a savings of £5 when you spend £35 or more on their range of selected electricals and gaming products. What do I need for Chromecast? You will need the Chromecast dongle, an HDTV with an extra HDMI port, a stable WiFi connection as well as mobile, tablet or a computer. The stick comes with a USB cable for power as well as a power adapter. So if your TV comes with a USB port, you can simply plug the power cable right into it or you can use a wall adapter. You can control the Chromecast device using your smartphone or tablet running iOS or Android and also your PC running Mac OS X or Windows operating systems. 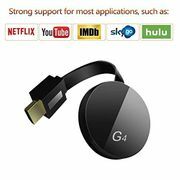 A Google Chromecast serves as a transmitter between the TV and the streaming video provider, just like an antenna or a cable box. You can use it for broadcasting Netflix, Hulu, YouTube, Google Play and more content to your device, which then displays it on your TV. How do I set up Chromecast? All you have to do is to simply plug it into your TV, have your computer or smartphone ready, and just follow the instructions. Once your device controller and Google Chromecast are connected to the same WiFi network, they will be able to recognize each other and will walk you through the rest of the process. What is a Chromecast Audio? Chromecast Audio is similar to the media streaming device. You plug it into your speakers in order to stream music via WiFi. It is compatible with Google Play Music, Spotify and Pandora and can be controlled using your Android and iOS devices as well as your computers.